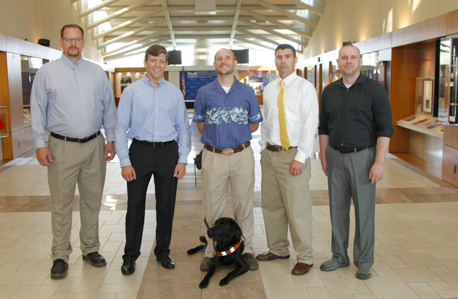 LAWRENCE — The University of Kansas Office of Graduate Military Programs has announced seven Wounded Warrior Scholarship recipients for the 2015-2016 academic year. Students who earn one of the scholarships receive up to $10,000 per year, renewable for up to four years. The scholarships assist injured veterans and affected family members in meeting the financial challenges associated with pursuing a degree at KU. Donations made to the KU Endowment Association to benefit the KU Wounded Warrior Scholarship Fund make these scholarships possible. Joshua Blake received the KU Keener Foundation WWS. He is a native of Larned and enlisted in the U.S. Marine Corps days after the 9/11 attacks. Blake served four years as an infantryman that included two deployments to Iraq. On his second deployment, in 2004, he sustained wounds from an improvised explosive device (IED) while on a dismounted patrol in Ramadi. Blake is a loving husband and father of four children. He is currently studying pre-engineering at KU. Adam Croft received a KU WWS. Adam enlisted in the U.S. Army in 2001. While on a reconnaissance mission in September 2005, he survived a white phosphorous IED attack in Iraq but suffered third-degree burns. Croft is an undergraduate seeking bachelor’s degrees in public administration and in Russian & Eastern European studies. After graduating he intends to enroll in a graduate degree program. Timothy Hornik is the recipient of the Bill and Shanthi Eckert WWS. Hornik is a native of Chicago, a retired U.S. Army captain, and the president of the Kansas Regional Group of the Blinded Veterans Association. In 2004, while serving in Iraq as an air defense artillery platoon leader, he was shot in the head and consequently blinded. Despite his injuries, Hornik obtained a master’s degree in social work from KU in 2010 and is currently pursuing a doctorate in therapeutic sciences at KU Medical Center. He plans to use his degree, along with his considerable social work case management experience, to assist and advocate for disabled veterans. Mackenzie Istook received the Heart of America Patriot Foundation WWS. Istook is a self-described “Army brat” and has lived in seven different states, two foreign countries, and attended nine K-12 schools. Istook’s stepfather, Sgt. First Class Jonathan Tessar, was killed Oct. 31, 2005, by an IED, along with three other soldiers on a mission in Iraq. Istook was a third-grader when it happened. Though she continues to miss him daily, she has moved forward with her life. She is excited to attend KU to continue to expand her horizons with a good combination of academics and involvement in a sorority. Corey Leach is the recipient of the KAMO Adventures WWS. Leach grew up in Olathe and enlisted in the U.S. Army in 2011. While on a foot patrol in Paktika Province, Afghanistan, he stepped into an IED blast zone and suffered severe injuries to his neck, left eye, shoulders and left leg. After completing extensive rehabilitation, Leach medically retired from the Army in 2014 and entered KU. He is majoring in exercise science and is determined to reach his goal of becoming a physical therapist and working with veterans and athletes. Adrian Lujano received the Heart of America Patriot Foundation WWS. Lujano enlisted in the Army in 2004 and served an 18-month combat tour in Afghanistan. During his tour, he survived multiple IED attacks and fierce fighting in the Korangal Valley and Kandahar Province with the 2nd Battalion, 87th Infantry Regiment. Following his active duty service, Lujano served in the New Jersey and Kansas National Guard. He is currently a senior in communications studies at KU. Donald Spradling is the recipient of a WWS. Spradling joined the U.S. Navy in 1996 and was severely injured while serving as a deck seaman aboard a guided missile cruiser conducting counterdrug operations in South and Central America. Upon retiring from the Navy in 2008, Spradling shifted his focus to education and earned a bachelor’s degree in civil engineering from KU in 2014. He is currently a graduate research assistant in the Department of Civil, Environmental & Architectural Engineering and is pursuing a doctorate in structural engineering. Graduate Military Programs established the Wounded Warrior Scholarship Fund in 2012 through KU Endowment. The first two scholarships were awarded for the 2013-2014 academic year with another three scholarships awarded for 2014-2015. Donations to the Wounded Warrior Scholarship Fund count toward Far Above: The Campaign for Kansas, the University’s comprehensive fundraising campaign. Donations can be made by contacting the KU Endowment Association at http://www.kuendowment.org. Photo, from left: Don Spradling, Corey Leach, Tim Hornik with Black Jack, Josh Blake and Adam Croft (not pictured are Mackenzie Istook and Adrian Lujano).